After learning her long-time husband is cheating on her, Sandra (Imelda Staunton) flees to the comfort of her sister Bif (Celia Imrie), and a community dance class, in Finding Your Feet. 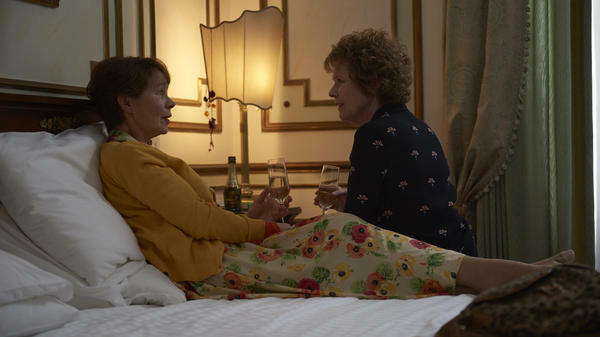 Sandra (Imelda Staunton) and Bif (Celia Imrie) used to be close. Bif even owes her nickname to a young Sandra's inability to pronounce "Elizabeth." But when the sisters went to protest nuclear weapons in the 1980s, Sandra ended up married to one of the cops who protected the status quo. That union propelled Sandra into the exurban upper-middle class, while Bif stayed resolutely leftist, bohemian and sexually fluid, although not so bleeding-edge that she knows how her cellphone works. Bif smokes pot with her oddly foppish pal Charlie (Timothy Spall), a freelance furniture restorer who drives a battered van and lives on a rundown canal boat for which he has grand ambitions. Still attempting to flaunt the privilege she lost when she fled her adulterous husband, Sandra immediately alienates Charlie. But they'll have a chance to reconsider each other's personalities when Bif drags her sister to the seniors' dance class she and Charlie regularly attend. With its attention to the details of downscale London life, Finding Your Feet occasionally suggests the work of Mike Leigh, who has cast both Staunton and Spall in his ensemble dramas. Most of the time, though, director Richard Loncraine and writers Meg Leonard and Nick Moorcroft meld the elements of two recent British mainstream-movie templates: the one where footloose elders experience new liberties but also wrenching losses (as in the Marigold Hotel flicks) and the one where overlooked blue-collar types reclaim their dignity by putting on a show (as in The Full Monty). Bif, Charlie and Sandra all have their secrets, although the first two's are much darker. Sandra's is simply that she wasn't always the prig she's become. In fact, she was quite the dancer in her younger years (as was Staunton). Hoofing to "Chantilly Lace" and "Le Freak" may save her yet. It's likely also to lead to romance. The sweet-natured if overlong Finding Your Feet plays on the novelty of old-age rebellion, as the three principal characters face cads, cops and the tyranny of home ownership. But the movie relies most heavily on its veteran performers, who can deliver any cliche — well, almost any — with conviction. Whether it's inspired, perverse, or just lazy to make over-60 actors prance through familiar rom-com routines, Staunton, Spall, and Imrie are up to the task. Finding Your Feet is a little stiff and a bit clumsy, but its cast is forever agile.